It’s time to open a new conversation. Adopt a secure-by-design architecture for real-time data communications on your device through Skkynet’s Embedded ToolKit (ETK), a Renesas Synergy™ Verified Software Add-on (VSA). You focus on great products – we help you connect them. Now you can IoT-enable them quickly and securely. View your data on the web, feed an industrial SCADA platform, or connect to other devices and systems. Put your products’ data streams right into your user’s hands – for one-way monitoring or two-way control. Connect to our end-to-end solution, and immediately tap into an industrially hardened communication technology that works in the plant, on the cloud, or both. No programming is required. Patented technology for outbound-only connections ensures no exposed attack surface – no open firewall ports, no VPN, and no extra hardware. Any network enabled device built on the Renesas Synergy platform can connect. Just add Skkynet to your application build and you get it all. Achieve IoT or in-plant networking speeds of only a couple milliseconds over network latency while reducing your data usage by as much as 60%. Deliver the experience of being on-site; see process dynamics as if you were there in person. 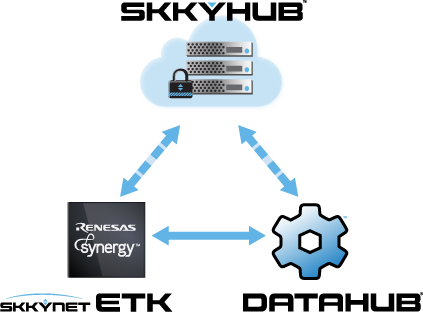 Renesas Synergy is fully integrated with Skkynet’s SkkyHub™ and the Cogent DataHub®. SkkyHub is an end-to-end solution that makes it easy to connect and network any number of industrial systems or data sources. The Cogent DataHub is a hardened industrial middleware that connects OPC servers and clients, Modbus TCP slaves ODBC databases, Excel, and .NET programs to your Synergy enabled devices, and supports OPC networking, bridging, redundancy, emails, process trending, and other system integration requirements. You can visualize real-time data with our built-in Web-based HMI – or your own, monitor or control your process or equipment from almost anywhere, and network any plant or remote system, with no additional hardware or programming necessary. Skkynet has been helping organizations securely share real-time data for more than 20 years. We offer privately-hosted or fully managed solutions for moving data in industrial, embedded and financial systems, from anywhere to anywhere.